From the many questions I have received about governors and their operation, I decided to explain how they work. Many people misunderstand their purpose, and hopefully, by the time you finish reading this page, you will have a better understanding of the governor system. Many people have E-mailed me saying “When I put the engine under a load, the governor is not kicking in. The engine is bogging down….” Well, If the governor was not working, you would know it. The engine would be running as fast as it can, and possibly blow up (not literally explode, but the rod will break in two and/or the piston can seize up in the cylinder). The governor does regulate how fast and engine can turn, but it does not speed up the engine under a load. It slows it down. As the engine turns, the crankshaft turns the camshaft, which, in turn, turns the governor gear. As the governor gear turns, centrifugal force makes two little weights (less than 5 grams each) fly outwards, forcing the governor spool to move upwards. Notice the little weights (next to red arrow). These weights are “L” shaped, so the feet will kick up the governor spool (next to white arrow). Depending on how fast the engine is turning, the governor weights will not kick up the spool as high. The slower the engine is turning, the lower the spool sits on its shaft. With that said you may ask “what does the governor spool do?” The governor spool is what pushes against the governor crank (a piece of “L” shaped shaft that has a wide, flat end on it. This shaft fits though the block and the govenor arm is connect to part of that shaft that is exposed to the outside of the block.) 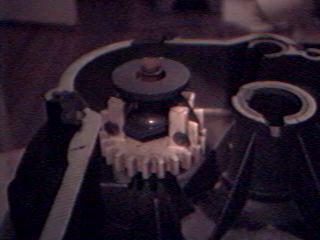 As the governor spool pushes up on the governor crank, the crank turns clockwise (turns the governor arm clockwise) which pulls the throttle to the idle position via a long solid link. Alright. Now we know that the governor closes the throttle, then what opens it? The governor spring is what opens the throttle. 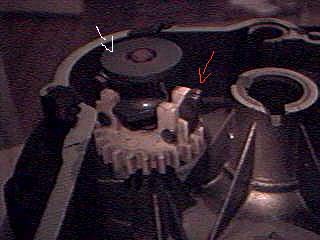 If you did not have a governor, the governor spring would pull the throttle shaft all the way open and keep it there. A 5 HP small engine with the throttle all the way open without a governor is capable of turning around 6,000 RPM. The object of the governor is to oppose the work of the governor spring to give you the governed speed. When you place the throttle in the “FAST” position on your lawn mower, you put tension on the governor spring, which pulls the throttle all the way open. When the engine gets going, the governor does its job as described above, and the engine speed becomes goverened to whatever the manufacturer of your equimpment set it to, usually around 3200 RPM. When you place the throttle in the “SLOW” position, less tension is put on the governor spring, which does not open the throttle all the way, slowing the engine down. one valve was sticking because of carbon building up , so I took the head off and cleaned these by polishing them with sandpaper. I moved the piston slightly in order to polish very small chemical deposits from the motor sitting idle for a long time. After putting it back together , then adjusting the valve rocker arm clearance , the compression checks o.k. the motor starts as it should, but runs at a very high r.p.m. , the throttle Is properly adjusted. when the throttle is backed off, or slows down , the motor dies immediately. it will only run with the chock closed. what is the problem?